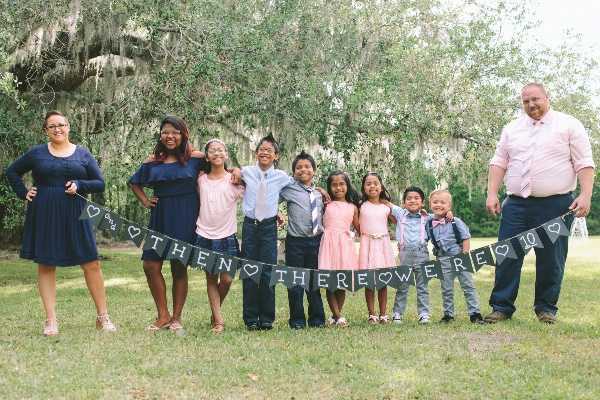 RINCON, Ga. — A Georgia family of three has now grown to ten after adopting seven siblings who have been in the foster care system for several years. Before they even met, Josh and Jessaka Clark knew that they wanted to adopt children. Jessaka’s parents took in foster children, and she and Josh both had a heart for youth needing families. However, even while embarking on the adoption journey two years ago, the Clarks never realized what life held around the corner. In March 2016, while endeavoring to take in two or three children, they received a surprising phone call from adoption officials. The couple committed the matter to prayer and believed that God was giving them the green light. Last August, they took in foster siblings Maria, 14; Elizabeth, 11; Guillermo, 10; Jason, 8; Kristina, 7; Katerin, 7; and James, 5, and have been waiting ever since for the official approval to adopt. The couple has one biological son, Noah, 3. “We fell in love with them immediately and it was super important to us that we kept all seven of them together,” Josh told WTOC-TV. “We waited 10 long months to finalize what we already knew in our hearts!” Jessaka also told Fox. On Tuesday, their desire became reality. A friend of the family has now set up a Go Fund Me page to help the Clarks buy a new house with more bedrooms as the children have one more sibling in foster care, but the state requires greater space before the family can adopt additional children. The Clarks additionally hope that their story will inspire others to adopt children in foster care. There are an estimated 13,000 children waiting for families in Georgia alone.